In accordance with Law No. 78-17 of 6 January 1978 relating to computers , files and freedoms, any person using the Site has a right to access, modify, rectify and delete data about. To exercise this right, simply make the request by sending us an email. « If you want Peace, work for Justice. 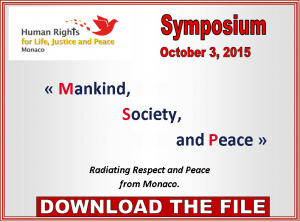 This Symposium is a gift from the Human Rights for Life, Justice and Peace Association to the Principality of Monaco to mark the 10th anniversary of the Reign of H.S.H. Prince Albert II and express special thanks to the Grimaldi dynasty for its work throughout the centuries to promote Life, Justice and Peace. The Monegasque constitution emphasizes the importance of respecting human beings and their environment; Article 9 is an institutional guarantee of this, without which neither social harmony nor peace in our hearts or between nations would be possible. Interpol was founded by Prince Albert I. Prince Albert II places great importance on respecting the environment, which is a pathway to Peace. This Symposium forms part of current concerns to reflect together on approaches to be taken to maintain Peace; the need to promote a Culture for Life, Justice and Peace among young people, who are building the world of the future; to denounce together the deathly behavior that hastens our world towards anguish, violence and distress. This assembly proposes to reflect on the ways that are open to young people to promote a culture of life and establish justice, a true work of peace and real harmony among all people. “Peace between nations will not be possible until we are convinced that true peace is found in the human heart”. (…) For Monaco and its inhabitants, I therefore wish for a model society and a society model.” (Speech for the Accession to the Throne, Prince Albert II, 12 July 2005).